Which Fabrics can I use for my Trinket Quilt? How much? It is nearly impossible to give an exact amount of fabric needed to make the pieced blocks in this pattern because it all depends on what you choose. 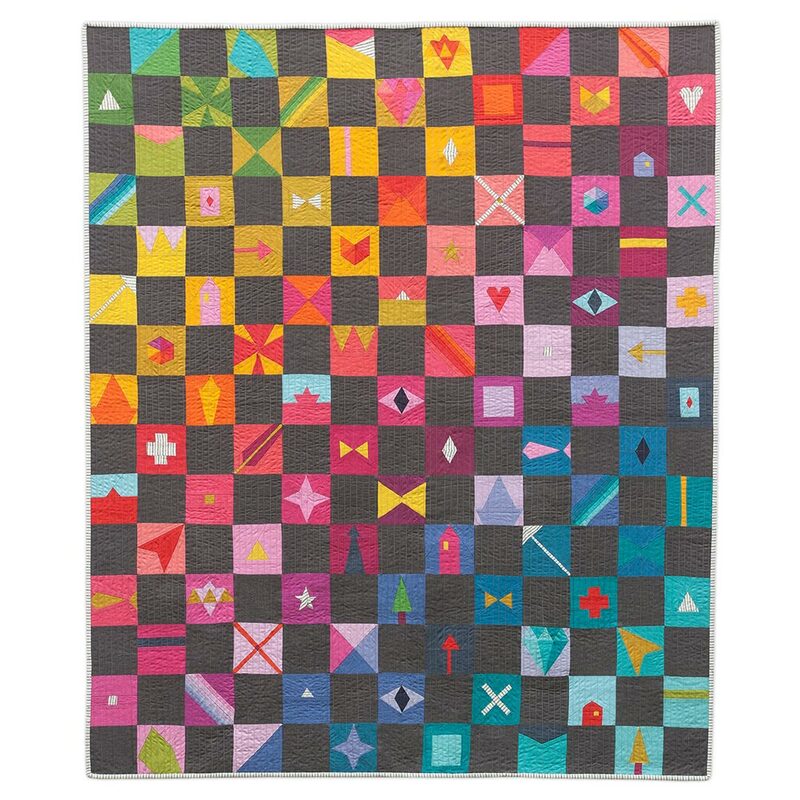 The hope is that you will enjoy the fun of picking color combinations that you love for each block to create a quilt that is as distinct as you. The designing is part of the fun! The cover quilt is shown in the Kaleidoscope collection by Alison Glass for Andover Fabrics. We started with a fat quarter of each of Kaleidoscope’s forty fabrics to make the throw size quilt. We also used Mariner Cloth in Raven, a woven black and white stripe, for binding and a bit of accent in the blocks. Although there was fabric left over, the quantity and variety of colors provided the freedom to enjoy making each block. The idea is for you to create something you love that is infused with personal meaning through the process of making. When you are gathering fabrics, we suggest pulling together a group that you love! Colors, prints, texture - it’s all fair game, and scraps work well too. Let it be open enough so that you can add to it, if needed. Forty fat quarters is plenty, but a good variety is key! What are my layout options? We think the cover quilt is beautiful, and we know a lot of you will probably want to make your quilt in a similar way. That’s great, go for it! The Trinket pattern is also an open ended resource to use the blocks in different ways. We are going to share a couple of alternate layouts as inspiration for your own creativity and distinct choices. Maybe you will come up with a fun, new layout? We are excited to see your creation! For the cover quilt, ninety-seven Trinket blocks are combined with ninety-eight fabric squares to create a checkerboard design in a throw size, but the blocks are very flexible! Add, subtract, and rearrange blocks to create a variety of designs and layouts. The pattern includes an Alternative Sizes chart with suggested size options/blocks needed/background fabric requirements. It does not include fabric requirements for the pieced blocks. The ‘30 - 40 fat quarters for the pieced blocks’ as listed on the pattern back is based on the cover quilt layout and size. The finished size is 52 x 60 and includes 97 pieced blocks (2 of each of the 40 blocks + 17 additional blocks of the maker’s choosing). If you choose a different size/layout/block style, your fabric needs will change. The key is having a mix of color that you love that you can add to if needed. This creates a more freestyle piecing/design, but it is staying true to the spirit of this pattern. This is just one example, but it is a great one! 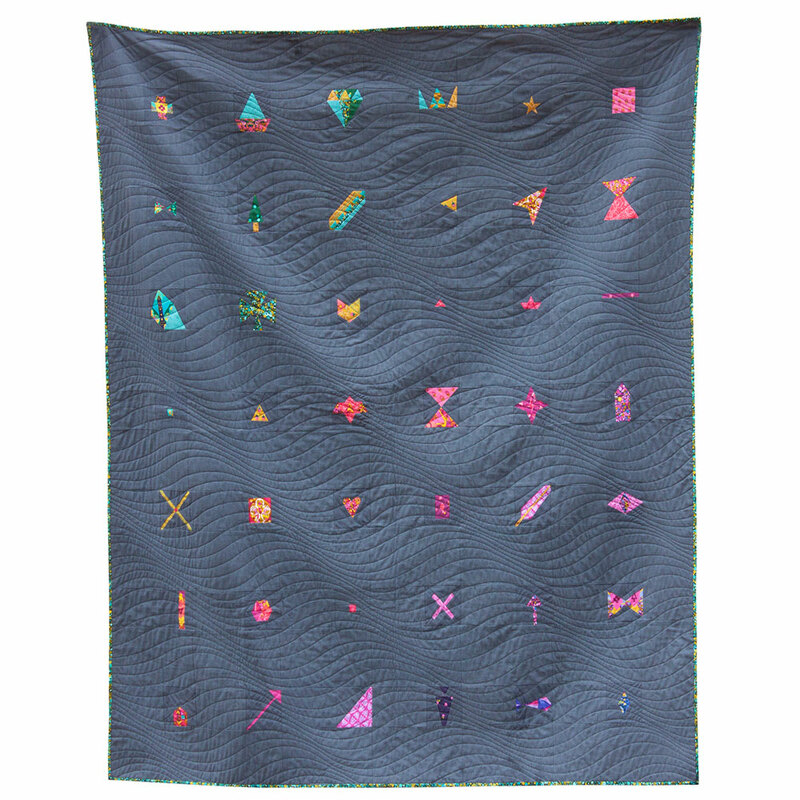 Our friend and copy/technical editor/general word supporter/question answerer here at AG, Leslie, @lelliebunny, worked like crazy to get her beautiful Trinket quilt done early so we could share it as another example! Leslie’s version has modifications to the block size and a different approach to the concept of background. The first change she made was to print/copy the blocks at 125% to create a larger quilt without adding any extra blocks (if you do this, don’t forget to keep your seam allowances at 1/4” because increasing the size of the template also changes the printed seam allowance). Leslie followed a similar color gradation as the cover quilt: a diagonal progression in color order. 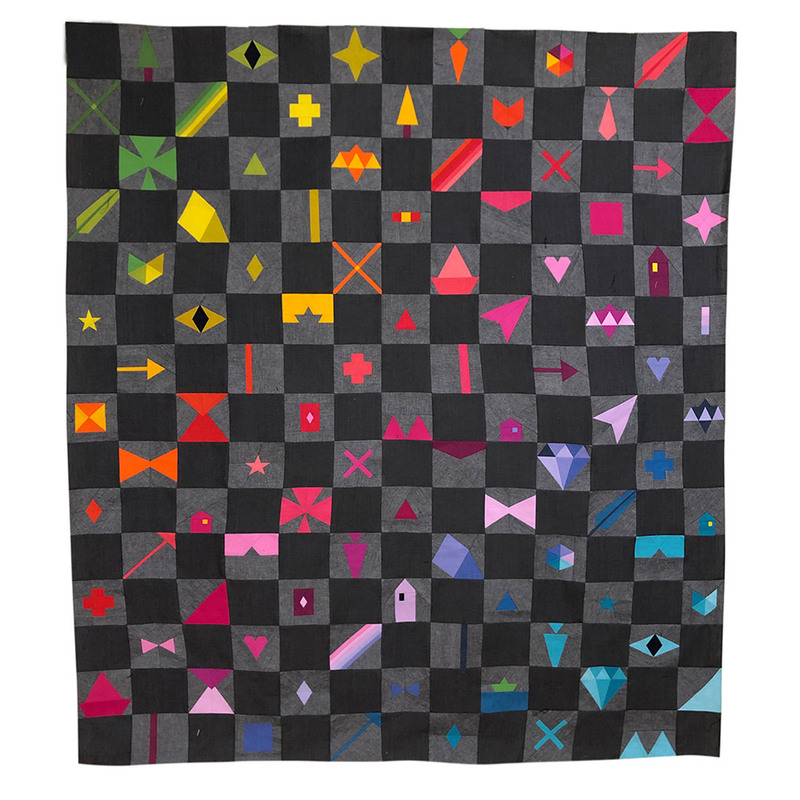 She also chose the same Kaleidoscope in Raven for the background squares, but the big shift she made was to use one color (Kaleidoscope in Charcoal) as a unified pieced block background. Doesn’t this change the look of the quilt dramatically? We love it! This one comes from an idea we had for these blocks from the start. We wanted a version with a more open layout: fewer total pieced blocks with more negative space around them to create a larger quilt and using the same fabric for the pieced block backgrounds and the main background so that the little bits could stand out on their own without the checkerboard effect. We chose the fabrics for each block from the Road Trip fabric collection, taking care to match each selection with the template pieces and sent the big stack to Karie, @kariejewell, who was kind enough to assemble the blocks for us. Karie send back the finished blocks for us to figure out the layout, spacing, and assembly of the top. It looks so different, and we love how it turned out! How do you Foundation Paper piece? where do I post my blocks (to win the weekly prizes)? We want to clarify that to enter to win weekly prizes you will need to post the assigned blocks each weekday (follow the schedule in the calendar) on your INSTAGRAM account using the hashtag #TRINKETSAL. We will be looking under that hashtag to see your posts! The biggest issue with all PDF patterns that include templates is that you need to be sure to print at 100%. Our templates always include 1/2” or 1” marks to compare/measure to be extra sure you are getting a true 100%, sometimes stated as ‘no scaling’. Many printers will default to less than 100% (this is common when a printer is set with ‘fit to page’ as the default option). Even if a pattern is printing at 98%, though it will look almost the same, it won’t come together correctly which can be really frustrating. The Trinket PDF templates are designed to print on standard 8 1/2” x 11” letter sized paper. We just use regular, cheap copy paper for our FPP templates here in the studio. That said, there are some papers made especially for foundation paper piecing. Pros to using specialty paper include being easier to remove and some are more transparent, making aligning fabrics easier. Cons are that specialty paper is often more expensive and due to the thinness, the template can get a little too torn up if you do need to rip out a seam. Two specific brands mentioned by members of the Facebook group are: Carol Doak Foundation Paper and Simple Foundations Translucent Vellum Paper, both by C&T. Newsprint from an art supply store was also suggested as an option. Be sure to use a shorter stitch length. The more perforations made by the needle, the easier the paper will be to remove. Use a slightly larger needle, like a 90/14, to make the perforation larger. After finishing a seam and before trimming the fabric, fold back the paper on the line. This is similar to pre-folding paper in a notebook before tearing it out. It prepares the paper to be removed easily along the perforation line. To ensure a flat, accurate block, you will press after each step. This is very important. There are various specialty tools available, such as a seam roller or handheld pressing tool, but using a dry iron is especially effective. Do not use steam. The moisture will warp the paper, and it may cause ink to bleed through the paper onto your fabric.